*You can also see this tip WITH VIDEO on my Lifetart Instagram account (I am FAR more active on IG than here on my blog). If you have any questions, just message me on Instagram! 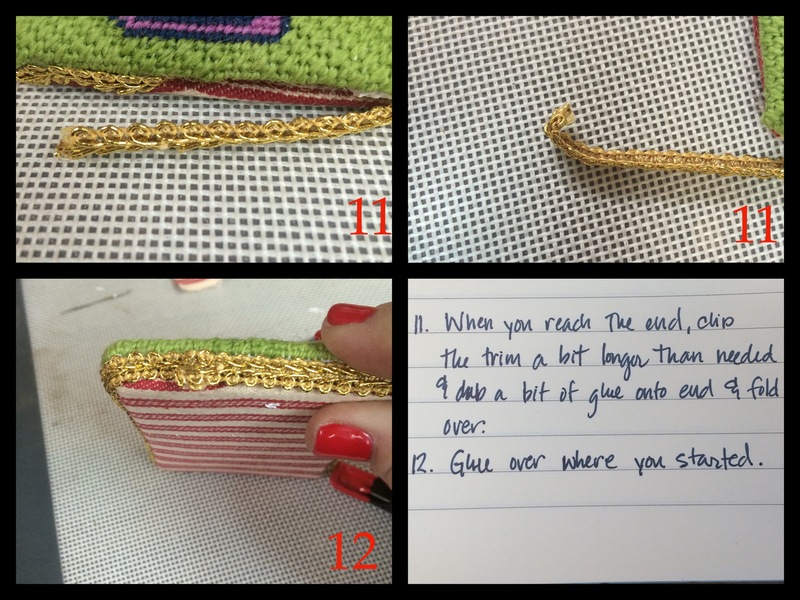 Super easy to make and makes any craft you do while sitting in a chair or the car SO much easier! 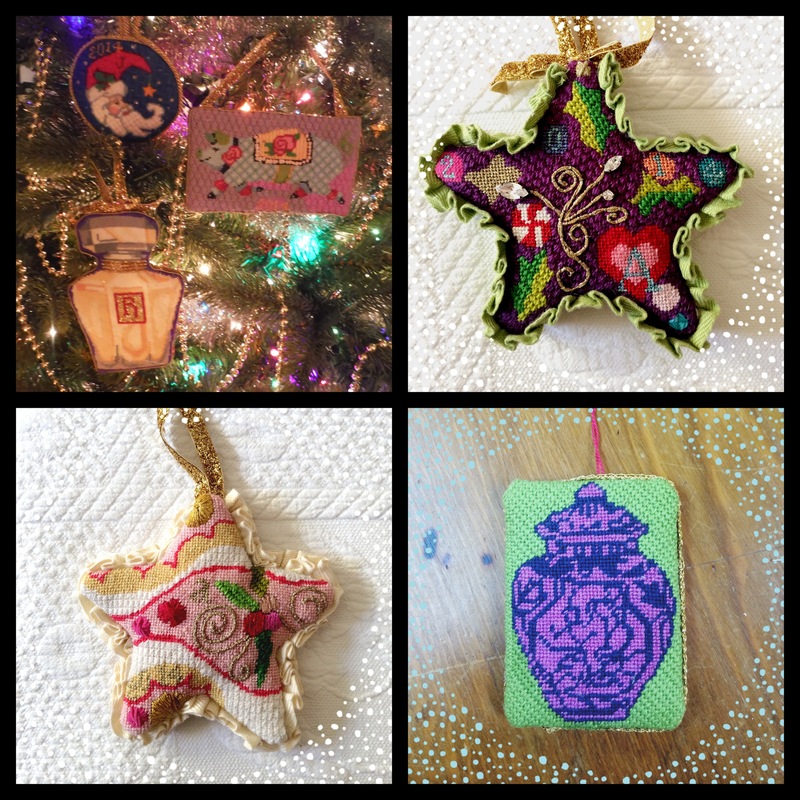 Needlepoint, embroidery, beading, etc. My “Lapboard” is actually a vintage cork backed board placemat (eBay usually around $15 for 4). 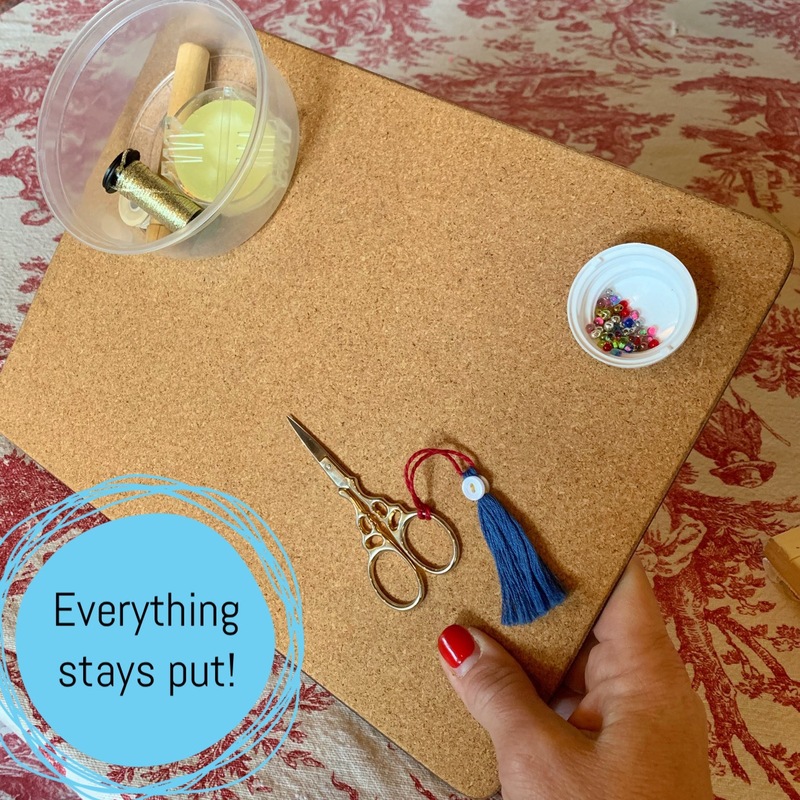 I love it because it provides a perfect place for stray things and the cork provides drag so things don’t slide off – (you could also use a small cookie sheet or a piece of chipboard). 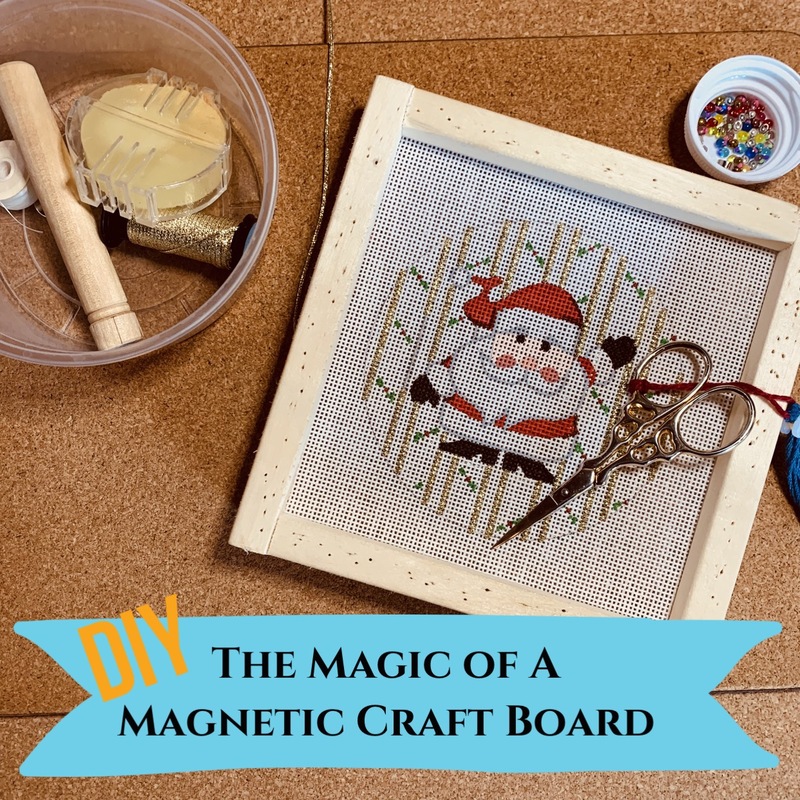 Using packing tape, attach magnets to the back of the board and place a magnet into any lightweight container and throw it on your board! 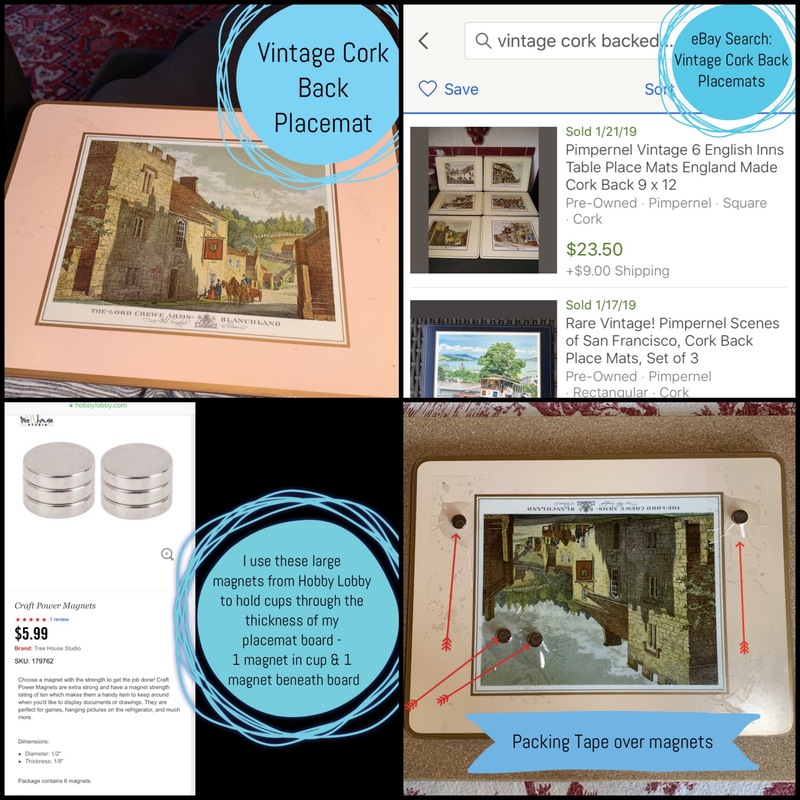 I use LARGE magnets (1/2” wide by 1/8” thick – from Hobby Lobby 6 for $6 online & in stores) – they are strong enough to hold things through the thickness of the lapboard and using two can anchor heavier things. 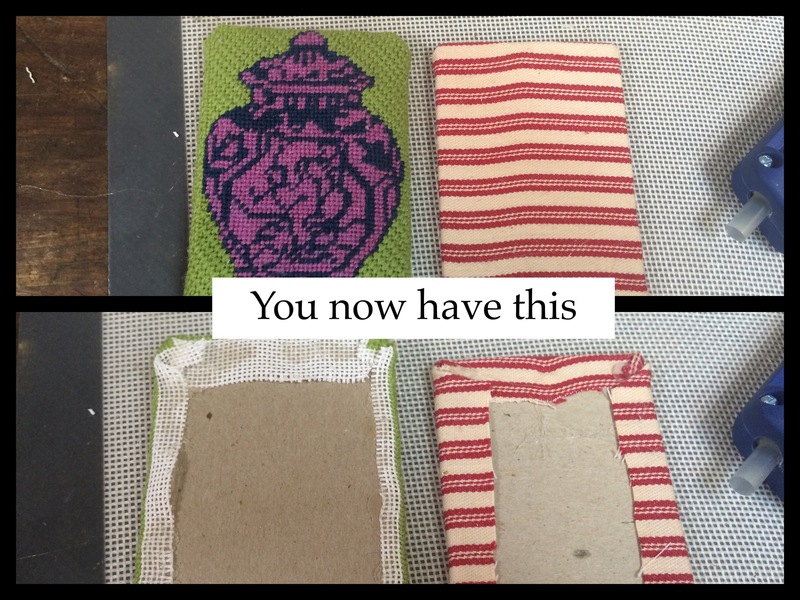 Smaller ones are not strong enough for the vintage placemats. Lapboard Hack: Since the front of the placemats are shiny and slick, gluing a piece of ultra suede or real leather suede on the shiny side would help anchor it on uneven surfaces (in the car!) 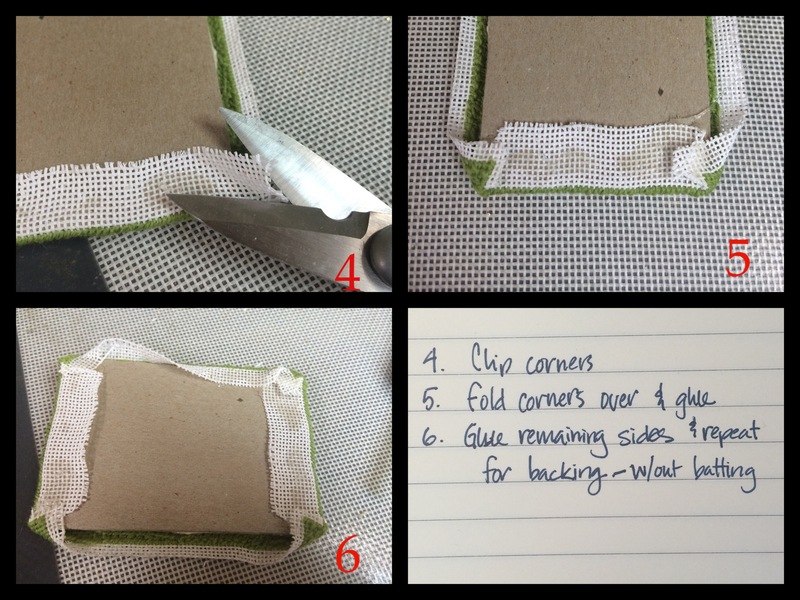 – just make sure to tape your magnets to the back before gluing on the suede! With Spring Break just around the corner, I thought I would share how I make travel photo books! Too many times the photos I take on vacation either stay on my SD card or phone and never make it onto my computer – and if they do happen to make it onto my computer, they never get any farther than that! Last summer, we took a three week trip to SE Asia and I was determined to record it, share the photos with friends and family while we were in Asia and have a photo book at the end! I came up with this idea and it worked flawlessly!! Enjoy! 2. Make your new account private or public. I made ours private because we were gone for three weeks and I did not want strangers to know we were away from home. 6. Take loads of pictures every day and upload to Instagram at night using hotel Wi-Fi with journal descriptions. 6. Order a “custom” book at end of trip. The custom book can be up to 366 pages. Lengthy journal entries will print on their own page. When you have uploaded 60 photos, Chatbooks will send you a confirmation – do not click “order” or you will end up with lots of little books about your trip. Wait until the end of your trip and order a custom book of the entire trip! 7. Consider making your Instagram trip account open to the public after you get home! If it is not filled with lots of personal information – you may want to share your adventures with the world! Whether you make it public or private, it is really nice to have a dedicated vacation account everyone can enjoy for years to come in addition to a nifty photo book! **This is not a sponsored post & I have not been compensated in any way to mention Instagram or Chatbooks. Last night I was making Ina Garten’s Raspberry Crumble for a school function and thought I would use that recipe as a base for thumbprint cookies. 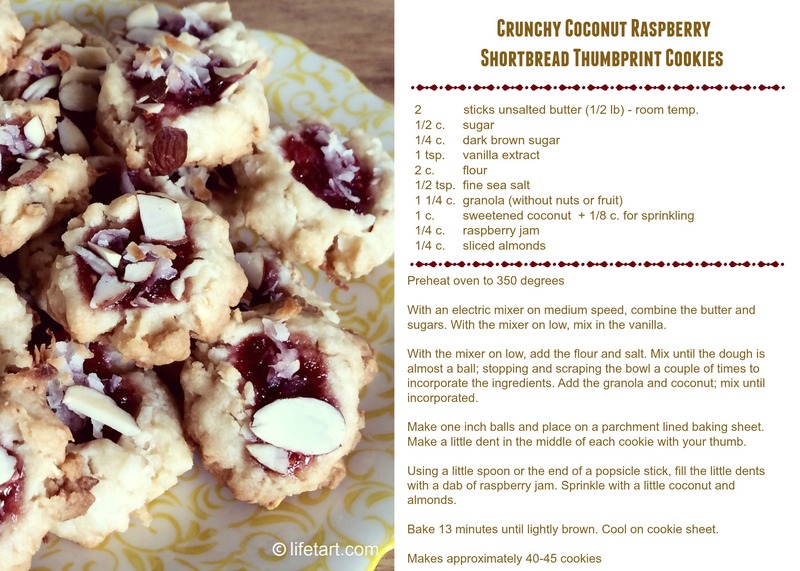 I played around, added a few ingredients and came up with this recipe for these cookies! Half were gone by this morning – a sure sign of a good cookie recipe! Hope you enjoy it! How to tie a PERFECT BOW! I have searched and searched and SEARCHED for how to tie a straight bow! FINALLY I found out how!! Recently I received a gift of Jo Malone perfume from my dear husband. 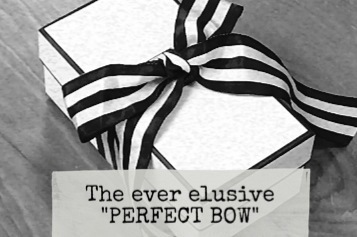 Upon looking at the bow on the box, I noticed how beautiful it was – how symmetrical – how even – how it didn’t tilt to one side like MY bows! As I carefully untied the bow, I took photos of each step of untying (it would drive me crazy to watch someone open a gift as slowly as I did – he is a very patient man!) and I made a video of how to tie this most perfect of bows! Here is a link to the video – for your reference and my own!! Enjoy!! 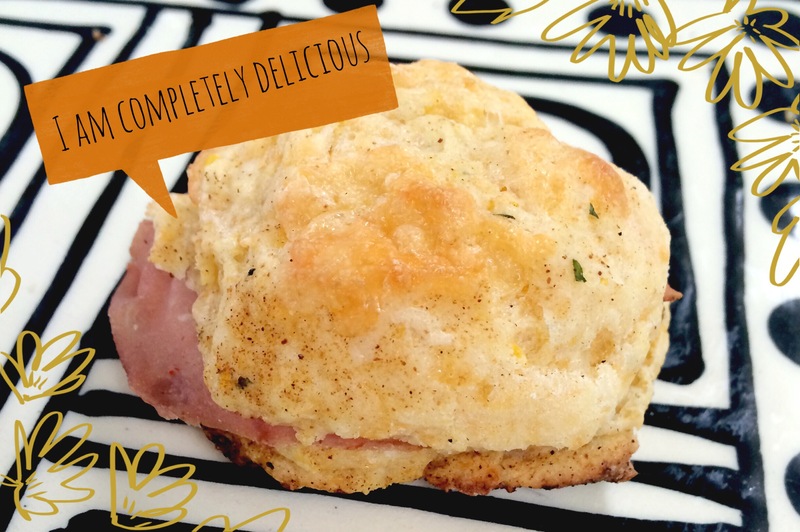 I had a cocktail party in my studio last night and served these amazing scone ham sandwiches and thought the recipe would be a good one to share because everyone at the party asked for the recipe! Astoundingly good, savory and wonderfully chewy! 1. In the bowl of a food processor, mix flour, baking powder, mustard, cayenne, salt and minced thyme leaves. Cut butter into 6 slices and add to flour mixture. Pulse until the mixture looks like fine crumbs. Add most of the cheese and all of the corn and pulse until incorporated. Mix the milk and lemon juice together and with the processor running add to flour mixture through the feed tube. Very quickly, it will form into a thick batter/dough – don’t overwork the dough. Don’t panic! This is a very wet dough! 2. Put dough on floured board, sprinkle with flour on top and knead a few times. Using a medium spring-loaded scoop (like a small ice cream scoop) – or a spoon, drop 1/2 golf ball sized pieces of dough onto prepared baking sheet. 3. Brush each scone with a little bit of milk and lightly press ball down with brush. Sprinkle with a bit of cheese and paprika and add a thyme leaf or two. 4. Bake for 7 – 12 minutes or until scones are risen and golden brown. Cool on rack. Add shredded ham to dough while kneading or add Herbed Cream Cheese Spread and ham to make little cocktail sandwiches! Mix all ingredients and use as spread for scones. 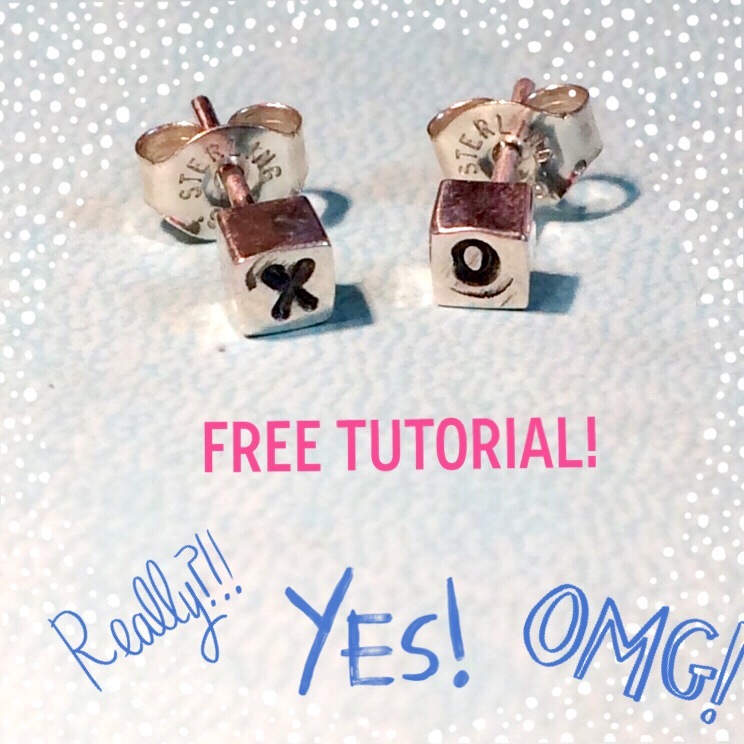 Itty Bitty Sweet Hugs & Kisses Earring Project! 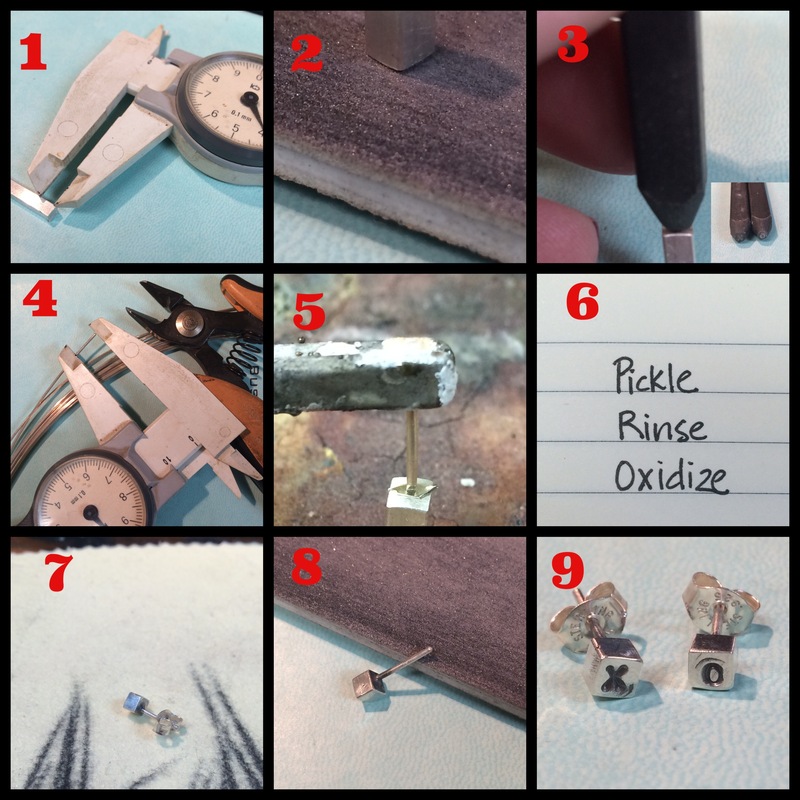 Since most of the jewelry I make it is quite large by most standards, it is difficult for me to come up with things for teenagers – because they like things small! 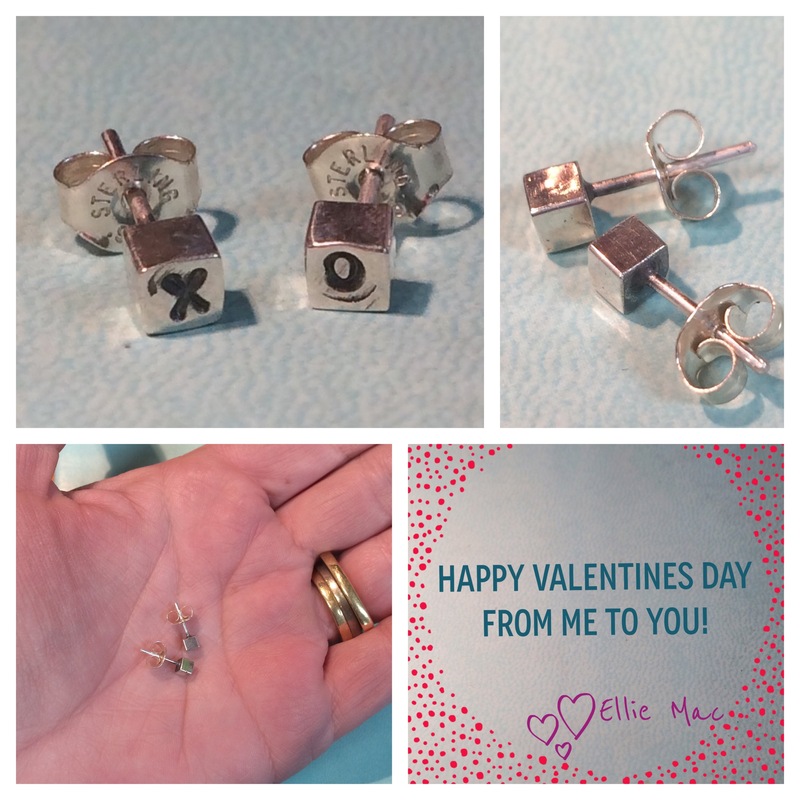 I came up with these for my daughter for Valentine’s Day and thought they would make such a fun project for you! 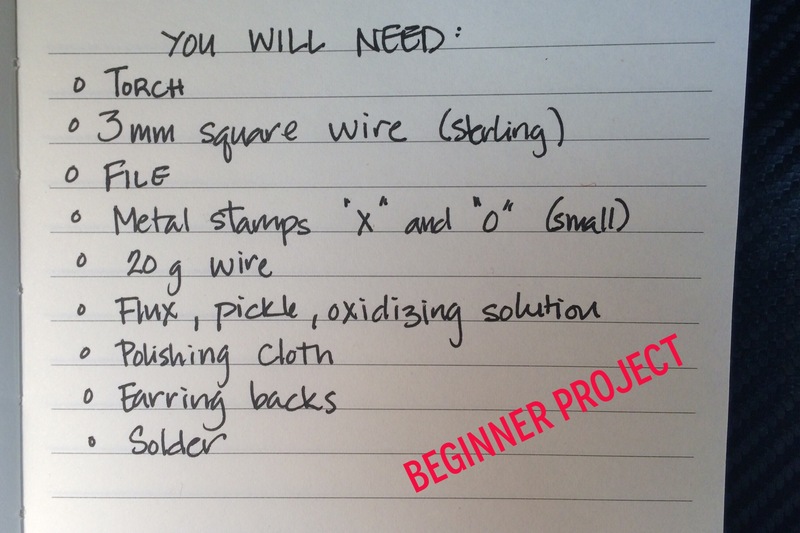 If you have some experience with silversmithing, these should take about 30 minutes! Enjoy!! 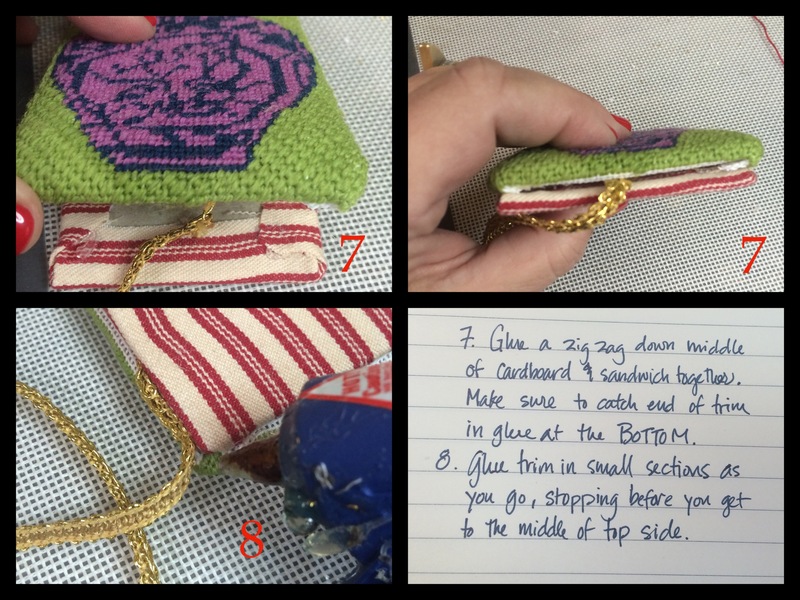 *** feel free to make these for yourself and as gifts – but please do not sell them….because stealing isn’t nice. 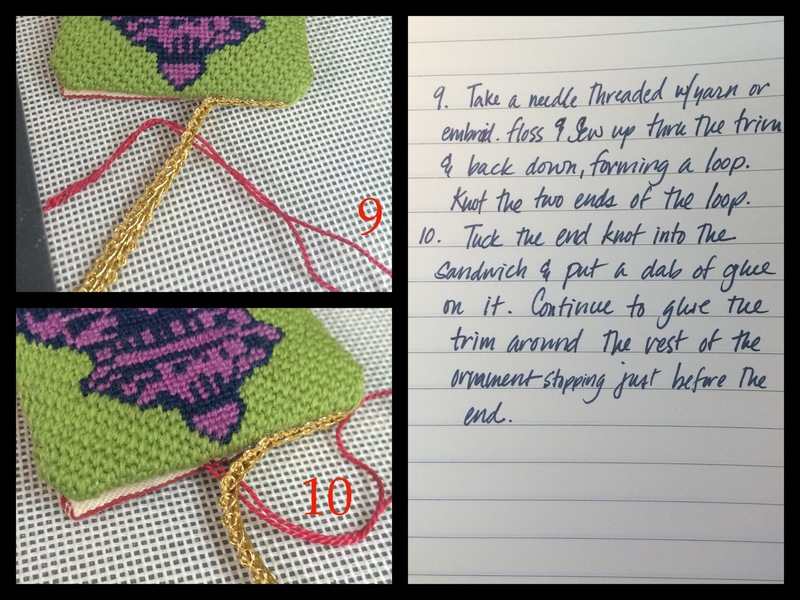 How to finish a needlepoint ornament! 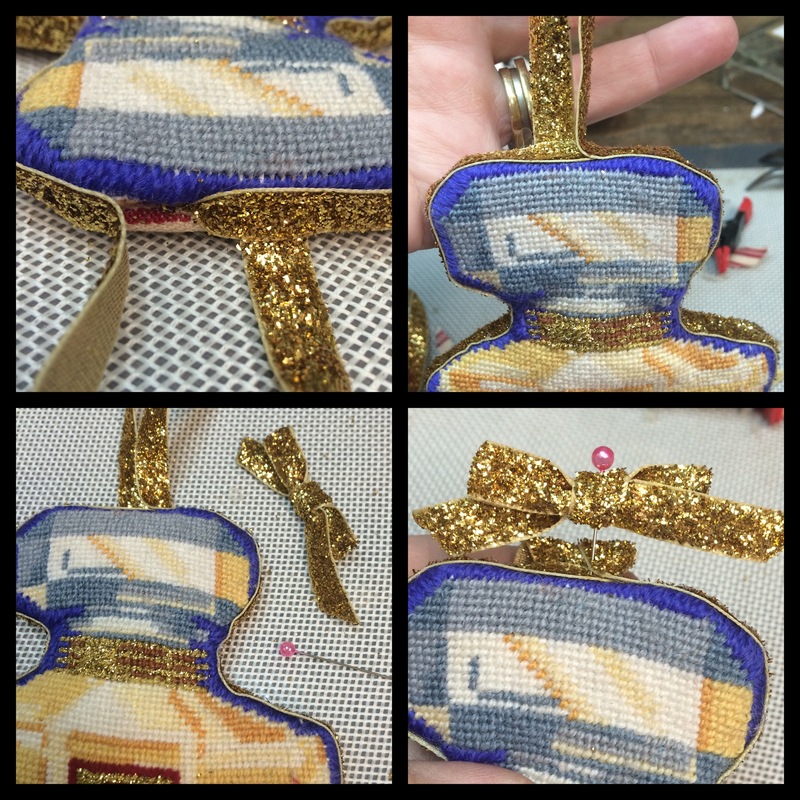 Here are process photos of how I finish needlepoint ornaments! There are many ways to do it, and this is how I do it! I am not great at responding to comments, so please do not feel bad if you do not hear from me – just thought you might enjoy! I LOVE A KID IN A CAPE AT THE GROCERY STORE…. You know when you see a “kiddle’ in a grocery cart and he/she has on a CAPE?! They feel so invincible, so awesome, so everything?! And you know that Mom – the one that let them wear that cape or princess dress to the grocery store? I was listening to a group of women talk about dressing their children (they were not talking about special events, but rather about daily life) and how important it was because they felt their children’s appearance was a direct reflection on themselves. I about spit out my coffee! 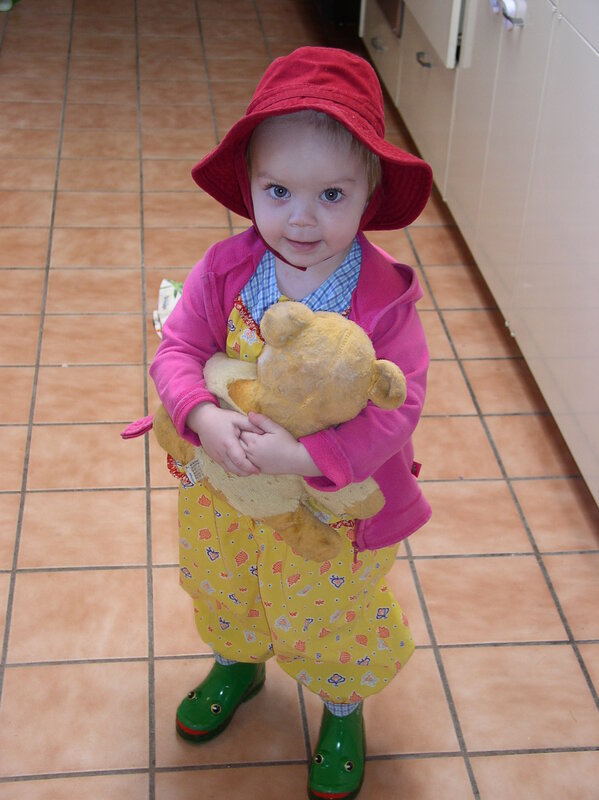 While I agree it is important to help choose their clothes initially, after the purchases have been made, LET YOUR CHILDREN DRESS THEMSELVES. PLEASE, just let them dress themselves….they are so much better at it than you are and it is IMPORTANT to them – I mean seriously, everything in their life is controlled for the most part – what they eat, where they go & what they do. When you look back at photos of them, dressed in whatever they wanted to wear…..you will be so glad you let them dress themselves! 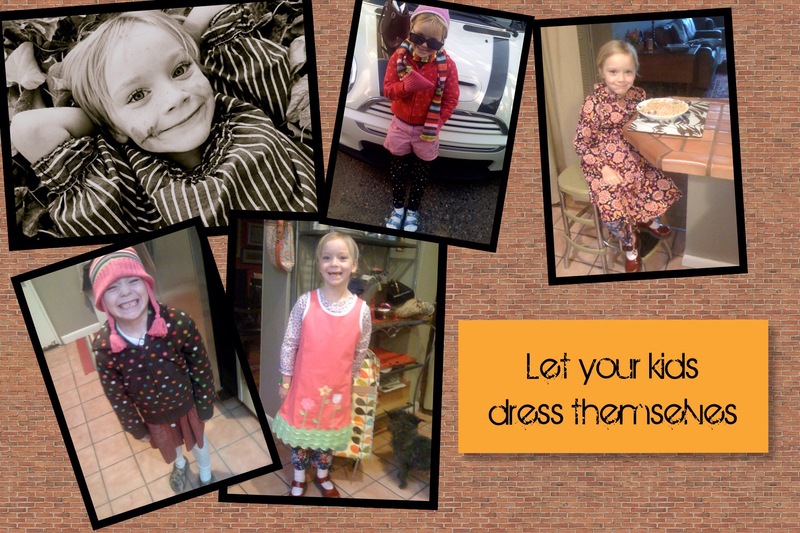 Pick their wardrobe….but let them dress themselves. 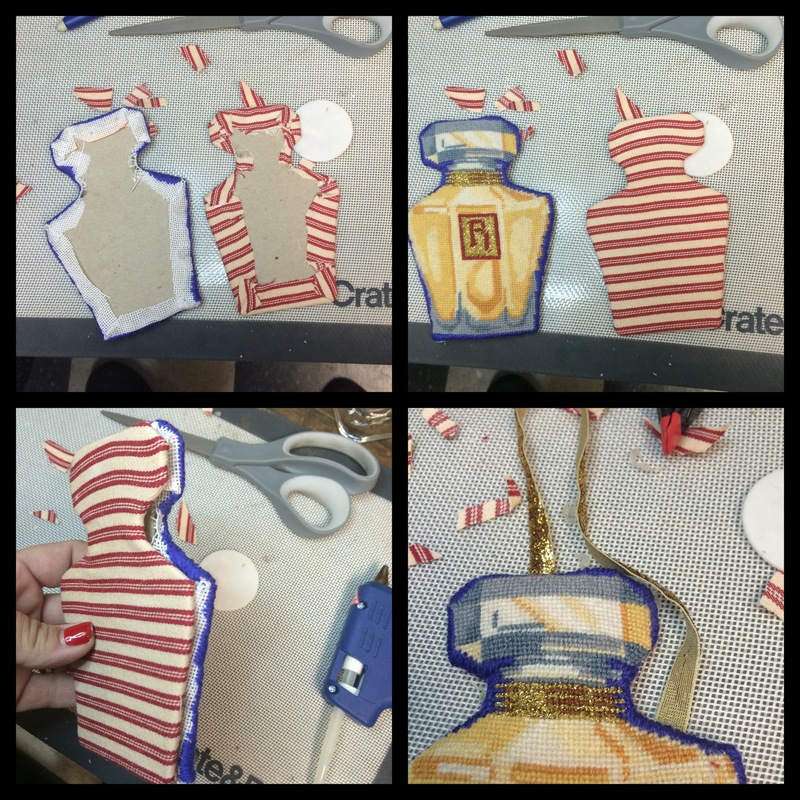 It’s like Scrabble with clothes!….and it is awesome! Awwww…did you see the boots?! My daughter loves our scrapbooks – it is like an illustrated fairytale of her (our) life – how could you not love that!? I love the IDEA of scrapbooks and I love scrapbooks themselves. 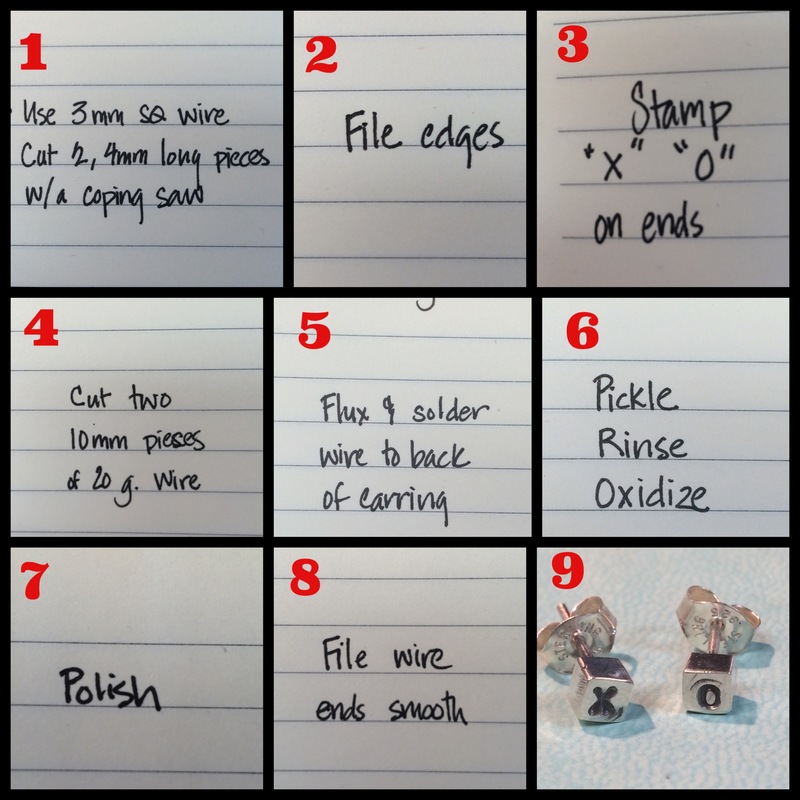 I love all of the little stickers, stamps, tapes and decorations for scrapbooks. I love having a hard copy of the most important photos on my computer. What I do NOT love is the stress of scrapbooking. When I bought an iPhone, I discovered some fantastic, easy apps & the stress disappeared when I developed a “SYSTEM” that is fast – and fun! I still get to use all those wonderful little decorations and we actually have a scrapbook to sit down and look through – which is better than a box of mixed up photos any day! 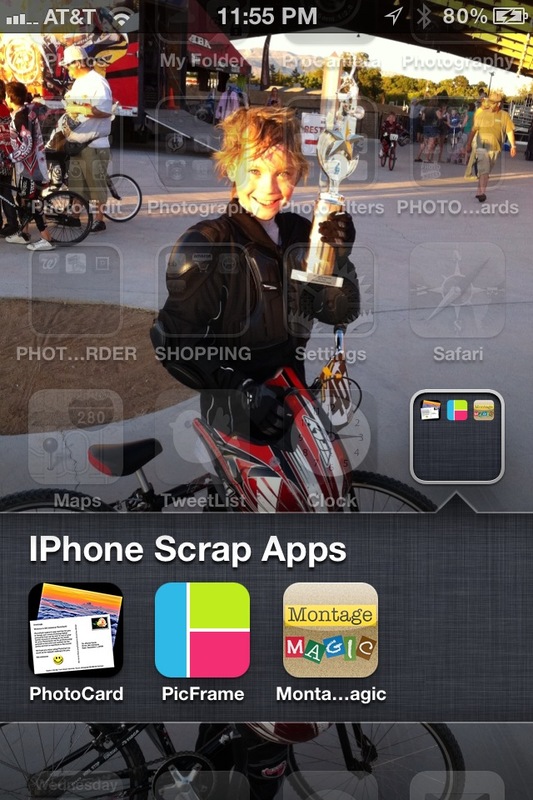 Scrapbooking with Iphone apps – made EASY, divided into three posts (I post on Wednesdays at 11:30 MT). 2. Apps I love & how I use them. Grids, Fun labels & Filters (tutorial). 3. 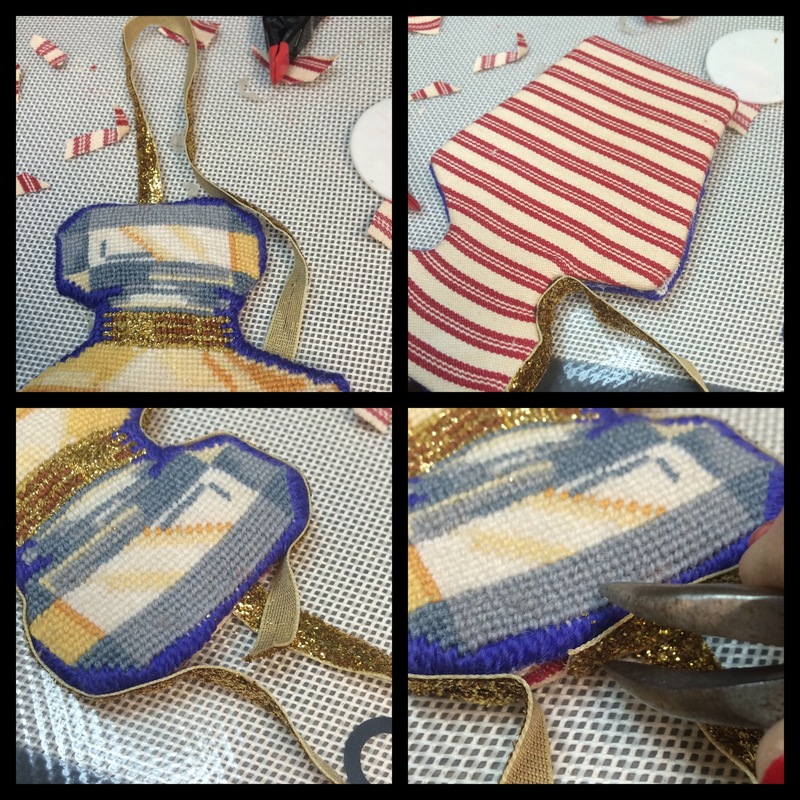 Tying up the loose ends from parts 1 & 2, extra apps – everything comes together! SO HERE WE GO! PART 2! VISUAL TUTORIALS OF MY FAVORITE APPS! 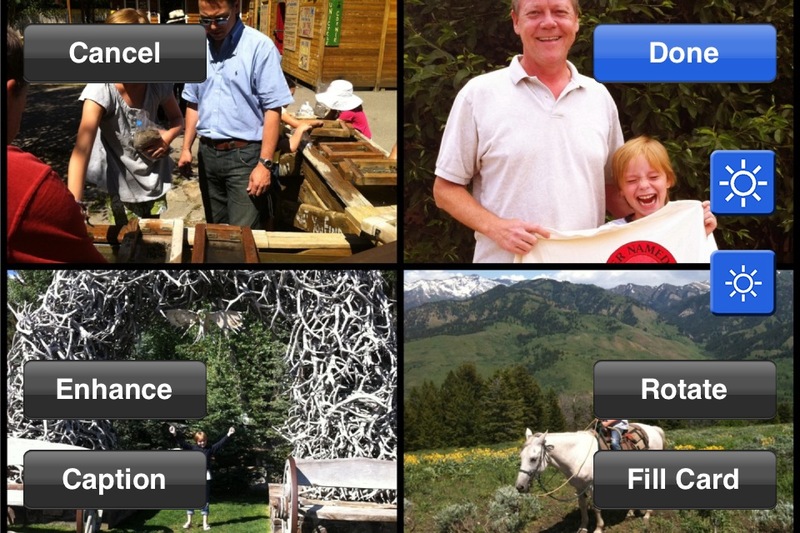 This app allows you to combine up to 5 photos into a grid and add labels. If you will be using your photo grid for a 5×7 postcard with the app PhotoCard, be sure to click the 3:2 measurement in the upper right corner (See #1). This app allows you to combine tons of photos, label them and has great backgrounds – wonderful when you want to use more than 5 photos! I previously posted a tutorial of this app and you can find it here! This is my MUST HAVE app. It is the backbone of my scrapbook – I use grids, filters & labels on my photos and always import them into PhotoCard to send a finished 5×7 laminated photo postcard to myself for my scrapbook. No tutorials on these apps – the filters are either super easy or difficult enough that I just mess with them until I get something I like and then save it; the labels are the same! Love this app! Let’s you add text like a ransom note with cutout letters! – only works for square photos – it will force you to make your photo a 1:1. Hard – unless you just play around with it until you find something you like. Next Post: WEDNESDAY, JULY 25th @ 11:30 a.m.
Be well! Have a safe weekend and July 4th! I have a cousin named Maureen who is an amazing scrapbooker. 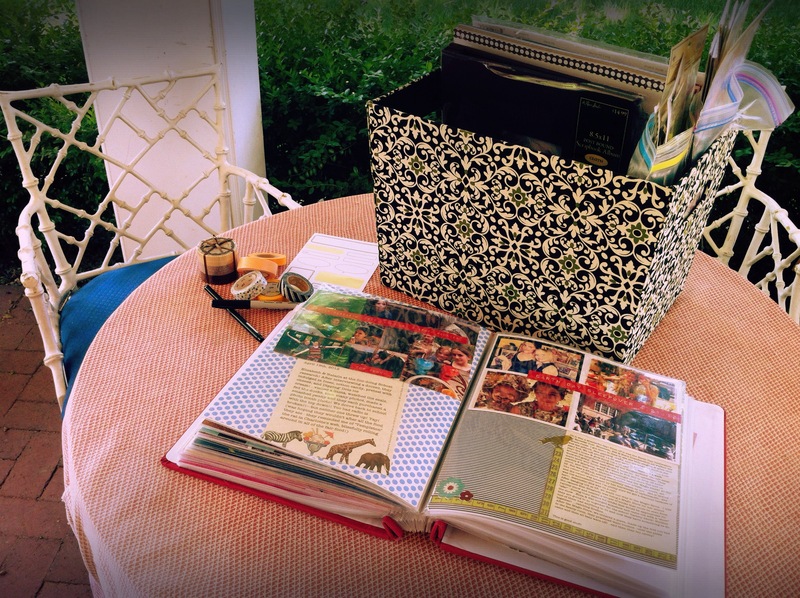 Her scrapbooks are like works of art – the layout, her color choices, use of space, font selection, etc. – she is a true “scrapbooker”. I on the other hand, am someone who loves scrapbooks – but try as I might, I just cannot make all the elements come together. I can order the prints. I LOVE to go to craft stores and buy all sorts of beautiful paper, stickers, tapes, pins, jeweled brads & tools. I love all the organizational bins & folders. But when it comes time to sit down and organize all those photos, date them, narrate them and use all those wonderful stickers and ribbon, it is soooooo frustrating that I end of getting very little done, and just throw everything back in the box. 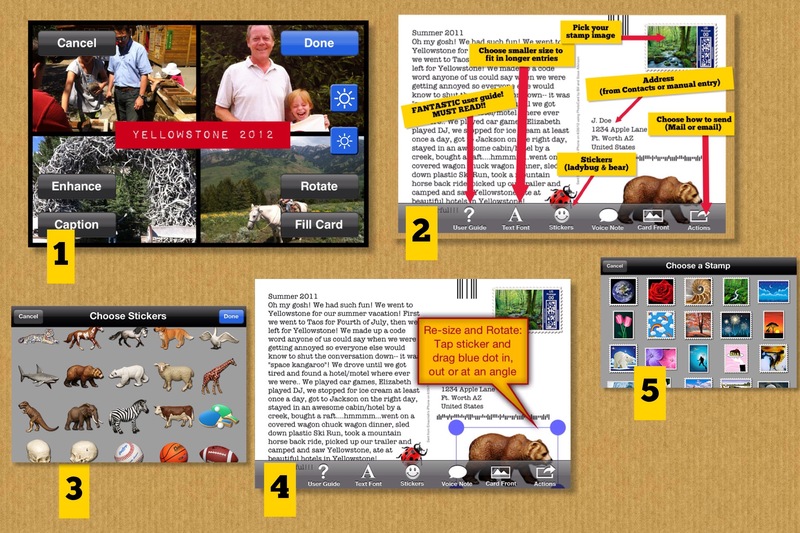 When I bought an iPhone and discovered some fantastic and easy apps, everything changed and I developed a “SYSTEM” that is easy & fast and when I am ready to make the pages, everything is dated and narrated AND the photos are already laid out!! While my scrapbooks are not works of art like Maureen’s, I still get to use all those wonderful little decorations and we actually have a scrapbook to sit down and look through – which is better than a box of mixed up photos any day! The narrations are way better than anything I could try to pull from memory – because I write them within hours of taking the photo!….usually! APPS: Get these apps and start playing around with them. 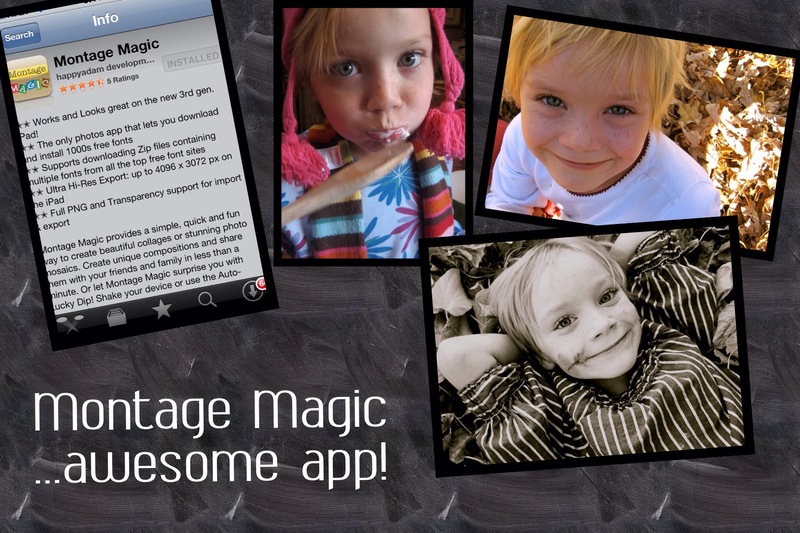 Montage Magic $.99 (How this app is only $ .99 I will never know. It is the only app I have ever run across that might actually be worth $10 – yes, it is that good! 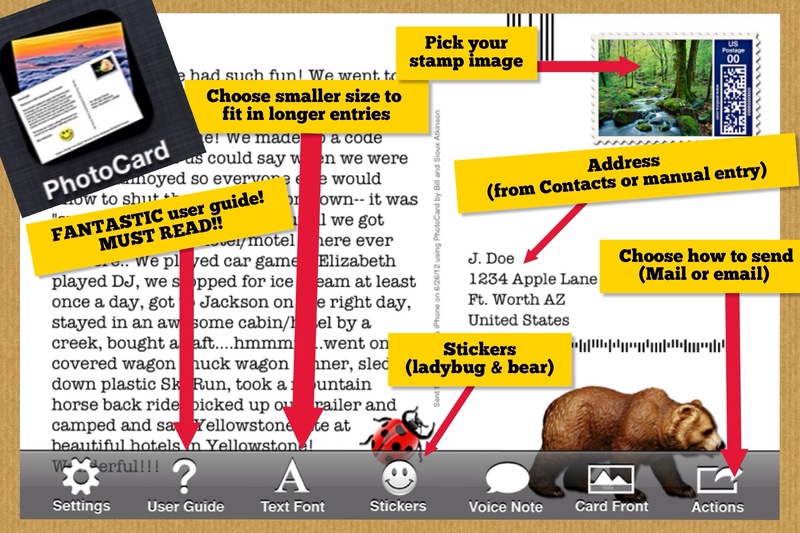 Lots of backgrounds, lets you drag photos & words around the screen and pinch or zoom to change the size. Also, allows you to download free fonts within the app from font sites on the internet. You can save your picture in high res. so everything is crystal clear). They are so easy, you probably won’t even need next week’s tutorial post, but I will show you some settings that are good to know about, etc. MY SCRAPBOOK “SYSTEM” – I swear to you, this is easy and it works. 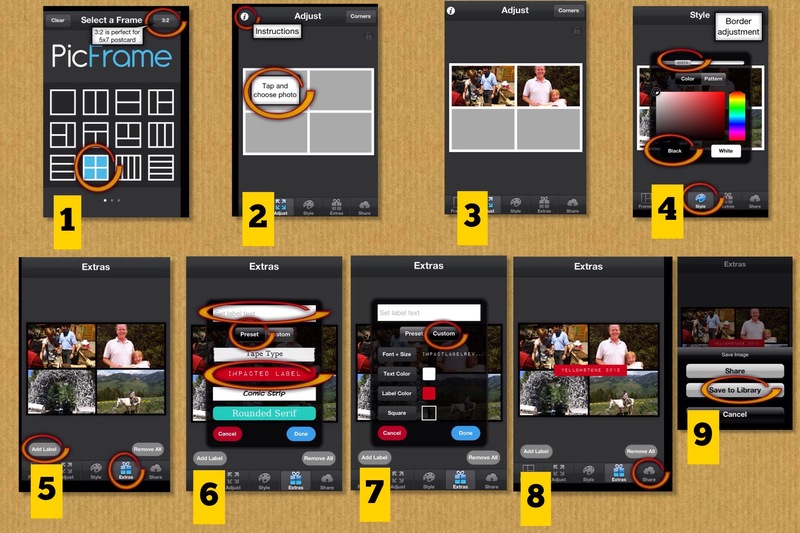 Use PicFrame or Montage Magic to label one photo or make up to five photos into a grid/collage and label. Save to “Camera Roll” in High Resolution. 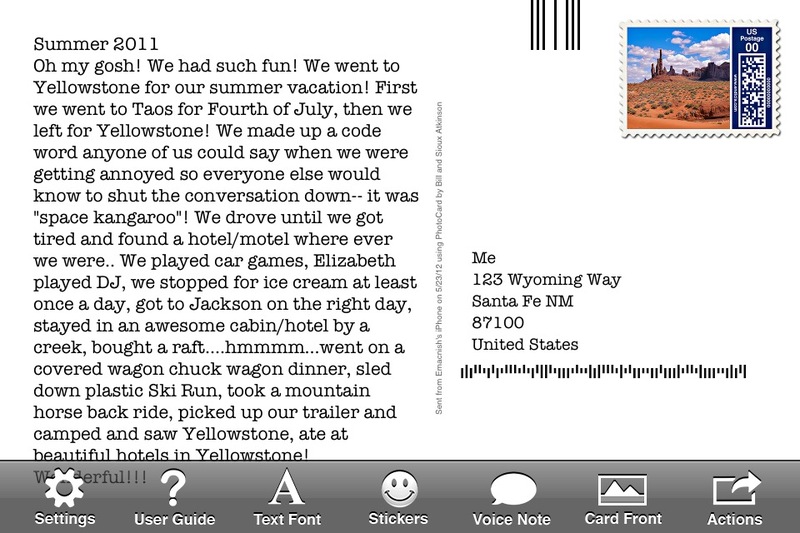 Use Bill Atkinson’s Photo Card to make your previously saved pic or grid/collage into a postcard. On the back, write a letter to yourself about the picture(s) and mail it to yourself. When your postcard arrives in the mail, throw it in your “scrap box**” (mine is in the kitchen) until you are ready to deal with it. When you are ready to use the postcard for a scrapbooking page, make a copy of the back and cut out the narration you wrote to yourself. Choose your paper, tape on the postcard and copied narration, decorate and slide it into the plastic sleeve of your scrapbook! **The black and white box in the title photo holds ALL of my supplies – Paper, stickers, adhesive ribbon, brads, double stick tape, scissors, labels and lots of Washi Tape!! 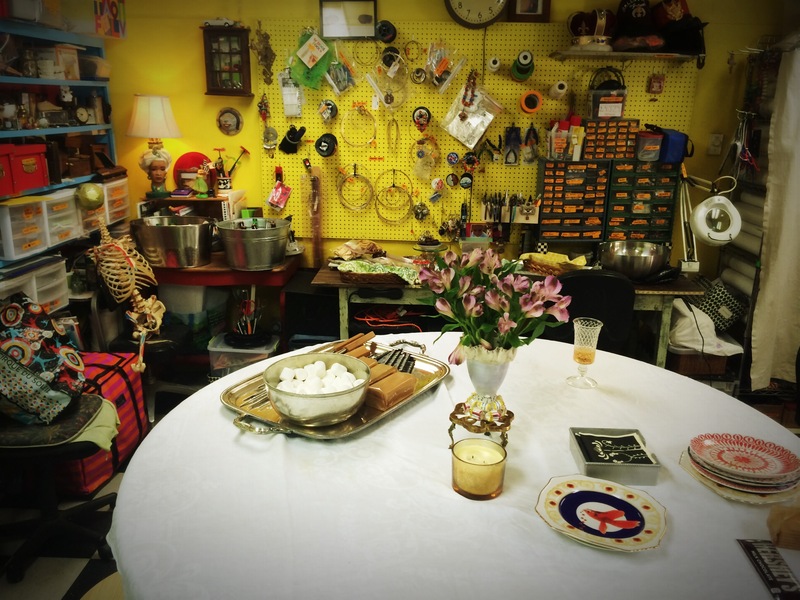 The scrap box’s “home” is on the floor, tucked into the corner under the breakfast bar in the kitchen – it’s pretty and no one notices it anyway (-or you could always keep it in a cabinet). The fact that this box lives in my kitchen is one of the “keys” to my successfully keeping up with a scrapbook because the kitchen is where I go through the mail. 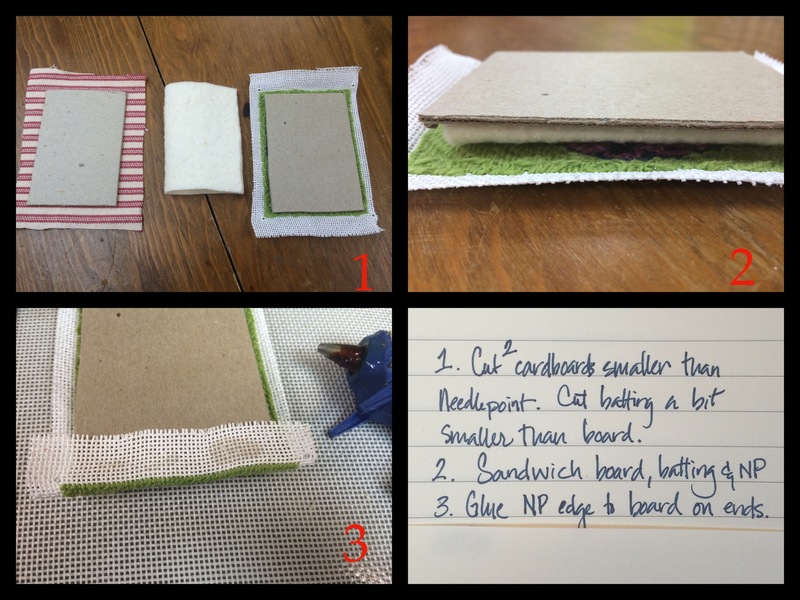 I use a 8.5 x 11 scrapbook because the size for page layout is easier for me. I buy them at Hobby Lobby (in our city, Michael’s does not carry this size of scrapbook or paper). P.S. Yes, this is the second time I have mentioned PhotoCard. No, I have not been paid to promote it – it is quite simply my “go to” photo card app and it is better than the others I have tried…..by leaps and bounds!